1 Finally, my brethren, rejoice in the Lord. To write the same things again is no trouble to me, and it is a safeguard for you. 2 Beware of the dogs, beware of the evil workers, beware of the false circumcision; 3 for we are the true circumcision, who worship in the Spirit of God and glory in Christ Jesus and put no confidence in the flesh,4 although I myself might have confidence even in the flesh. If anyone else has a mind to put confidence in the flesh, I far more: 5 circumcised the eighth day, of the nation of Israel, of the tribe of Benjamin, a Hebrew of Hebrews; as to the Law, a Pharisee; 6 as to zeal, a persecutor of the church; as to the righteousness which is in the Law, found blameless. 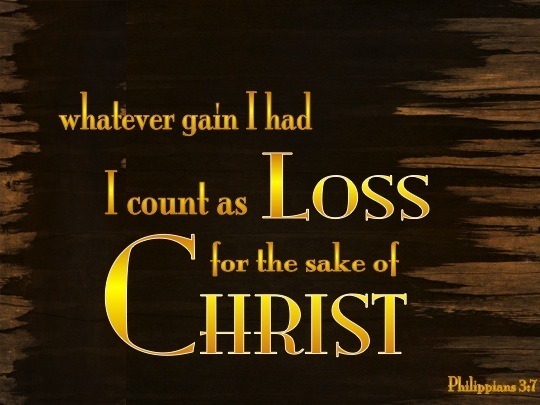 7 But whatever things were gain to me, those things I have counted as loss for the sake of Christ. 8 More than that, I count all things to be loss in view of the surpassing value of knowing Christ Jesus my Lord, for whom I have suffered the loss of all things, and count them but rubbish so that I may gain Christ, 9 and may be found in Him, not having a righteousness of my own derived from the Law, but that which is through faith in Christ, the righteousness which comes from God on the basis of faith, 10 that I may know Him and the power of His resurrection and the fellowship of His sufferings, being conformed to His death;11 in order that I may attain to the resurrection from the dead.